This installment of the After Class series in the December 1957 edition of Popular Electronics deals with inductors. It is a beginner-level introduction to how reactive components behave in circuits. For some reason the concept of magnetism's influence on electrical current (present with inductors but not capacitors) seems to be more difficult to comprehend than that of electrons, even though James Clerk Maxwell shows in the mid 1800s that the two phenomena are interrelated. 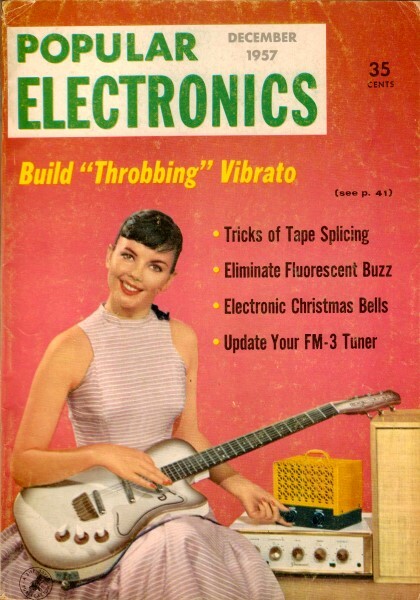 I am tempted to say that back in the 1950s when this article appeared, people were less familiar with the relatively new concept of electronics, but in thinking about it, your typical 2019 reader is probably even less likely to know anything at all about electronics or the way basic components work. I would bet that maybe 1% could even tell you the difference between AC and DC current - or the difference between current and voltage for that matter. "I know what an inductor is - I think ­ but I'm pretty hazy as to its use in an electronic circuit. And while we're talking about inductors, exactly what's the difference between a solenoid and a toroid, which I understand are two forms of inductors'!" Picture a complicated highway interchange with no directional signposts, traffic lights, or highway police, and you have a pretty good idea of what an electrical circuit would be like without "oppositional" components that guide, cajole, and coax electrons to follow prescribed paths. Resistors, capacitors, and inductors - occurring singly or in various combinations ­ comprise the fundamental oppositional elements that direct electronic traffic so skillfully even in complex circuits. Fig. 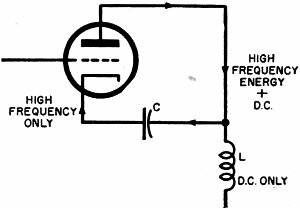 1 - Rectifier changes a.c. to pulsating d.c. Fig. 2 - Filter smoothes pulsating direct current. Ordinary resistors are undiscriminating components; they oppose d.c., a.c., high frequency, and low frequency alike. A given current of any type passing through a specific resistor causes the same voltage drop. Capacitors are different; they oppose changes of voltage in any circuit of which they form a part but do not react significantly to rapid current variations. Inductors vs. Capacitors. An inductor may be viewed as the exact opposite of a capacitor. Made up of turns of wire in the form of a coil, an inductor opposes current rather than voltage changes, especially when these variations occur at a high frequency. This characteristic makes the inductor a useful complement to the capacitor in a power supply filter circuit. A full-wave rectifier circuit changes alternating current to pulsating direct current (Fig. 1). This "hill and valley" formation of pulsating d.c. is usually not suited for operating d.c. electronic equipment until the "valleys" are filled in . Consider the filter circuit shown in Fig . 2. As the pulsation appears across the capacitor C, the latter charges to the peak voltage (points labeled A) of the input wave. When a valley appears (points labeled B), the capacitor attempts to discharge through the inductor L into the load, which may be any device that uses direct current. Since such a discharge would constitute a sudden surge of current, the opposition that inductor L offers to such an abrupt change forces C to retain most of its charge until the next peak appears to bring it back to full charge again. In this way, L assists C in maintaining the circuit voltage constant, an action necessary to change pulsating current into pure d.c. In this circuit, L is termed a choke. Opposition Factors. The opposition an inductor or choke presents to varying currents depends upon two factors: (1) how fast the current varies (frequency), and (2) the physical construction of the coil - the number of turns, turn spacing, coil diameter, and kind of core. A filter choke of the type just described has hundreds of turns of fine wire, an iron core, and is said to have a high inductance. Just as resistance is measured in ohms, e.m.f. in volts, and current in amperes, inductance is measured in henrys. The symbol "L" signifies inductance. Smoothing chokes usually run from 10 to 30 henrys. Any time a circuit condition calls for choking off a rapidly varying current, an inductor of the correct size used in conjunction with a properly chosen capacitor can do the job. For example, suppose an electron tube is generating a current of high frequency, say 1,000,000 cycles per second (1 mc.). This tube is fed d.c. voltage and current from a power supply, but the high-frequency current is not to be permitted to flow backward through the supply. Fig. 3 - "L" blocks high frequency, "C" passes it. Fig. 4 - The toroid has a doughnut-shaped core. Fig. 5 - Solenoid is wound around straight core. Connecting an inductance and capacitor as shown in the partial schematic (Fig. 3) fulfills this requirement by permitting the d.c. to flow through the inductor but opposing the high-frequency current back-flow through the inductor. The capacitor provides an easy path for the high-frequency current to return to the tube - a necessary arrangement to assure a complete circuit for this energy. An inductor like this has relatively few turns wound on a ceramic or plastic core; its inductance might range from 2 to 10 millihenrys (0.002 to 0.01 henry). Because the frequency is so high, not much inductance is needed to place a barrier in front of the incoming varying current. 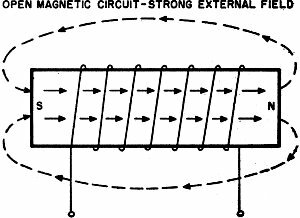 In summary, an iron core coil of many turns has a high inductance and is especially useful as a choke in low-frequency circuits; high-frequency hookups call for low-inductance coils of few turns on non­magnetic cores. Toroids and Solenoids. Over the years, toroids have been used desultorily by many of the larger overseas communications companies for the special filter applications in which they perform particularly well. The last decade has seen a steady growth in the number of circuits and devices in which toroid ally wound coils have come to be preferred over solenoid types. The word toroid describes a method of coil winding. Fig. 4. 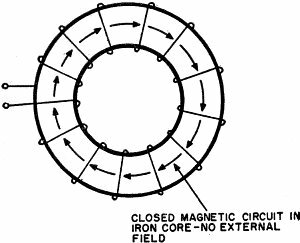 Turns are placed around a doughnut-shaped core which forms an absolutely closed magnetic circuit as illustrated. A solenoid, on the other hand, is generally defined as a coil fabricated on a straight core, sometimes iron, and other times air or non-magnetic solids like plastics or fiber - see Fig. 5. Certain types of transformers have two separate solenoid coils on a common core. What is the secret of the toroid's sudden rise to prominence? Known for many years to be vastly superior to solenoids in certain important respects, toroids were avoided by designers and manufacturers for two reasons. Suitable core materials were not available, especially in applications involving the higher audio frequencies and the radio frequencies. And automatic machines for winding turns around a doughnut core were virtually unobtainable at any price. Neither of these problems exists today. High-speed automatic toroid winders form these inductors just as quickly as solenoids; and modern core materials like Permalloy dust, the ferrites and mu-metal make them practical for use at the higher frequencies. The "open" magnetic circuit of the solenoid forces its lines of force to travel through the surrounding open space to link with the core at both ends, whereas the "closed" path of the toroid core confines the field to the molecules of the core so that there is little or no external field. Two very significant advantages arise from this behavior: first, it makes possible higher inductances with fewer turns of wire, and second-probably much more important ­ it does away with the need for careful shielding. Where there is no external field surrounding inductors, there can be no electromagnetic coupling to cause un­wanted regeneration and oscillation. In general, toroids may be stacked one on top of the other in the same case without interaction for the reason given above. Their most important use at present is in wave-filters (resonant and non-resonant traps and peaking circuits). They may be made very stable and unresponsive to temperature changes and vibration, and may be designed with very high Q's even at frequencies up to 60 kc. or 70 kc. Look for toroid transformers to replace solenoid types in many of the forthcoming high-fidelity systems still on the design boards.